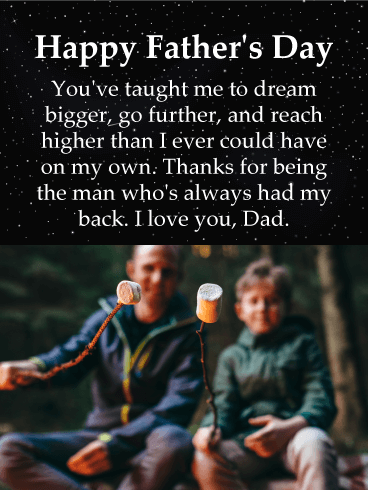 To the man who taught you to dream bigger and reach higher, here is a Father's Day card that gets the special bond between a father and his son. Send your dad a wilderness Father's Day greeting card that brings back fond memories of camping together and roughing it in the great outdoors. Your dad is one in a million and you wouldn't be the man you are without him. 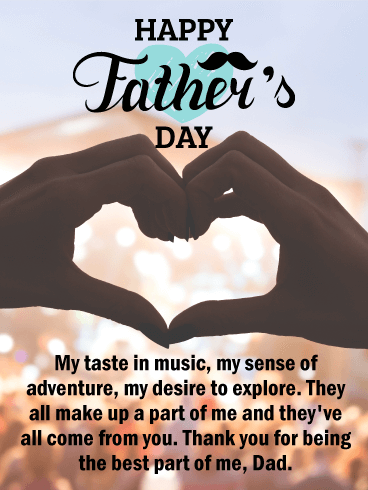 This terrific Father's Day card from son is perfect in every way-just like your dad. Happy Father's Day - You've taught me to dream bigger, go further, and reach higher than I ever could have on my own. Thanks for being the man who's always had my back. I love you, Dad. With a whimsical touch, this Father's Day card is perfect for wishing any cool dad the best celebration yet! 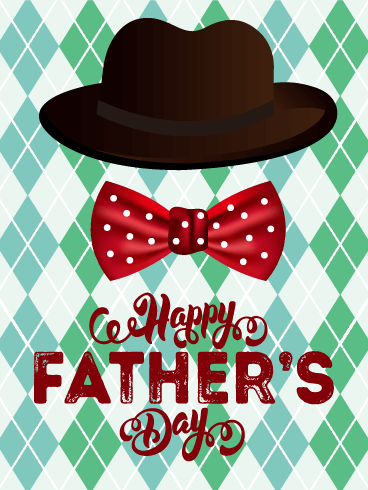 A blue argyle print in the background adds some color, while the bold "Happy Father's Day" message in front brings plenty of style...especially with the hat, mustache and tie included right into the design. 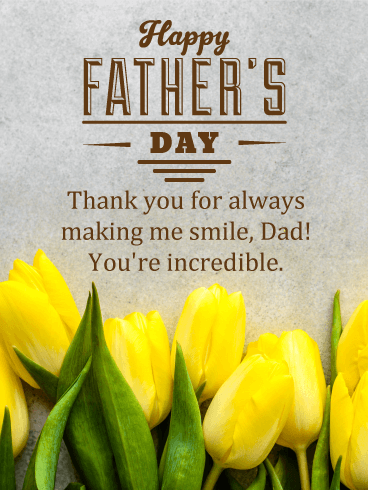 Whether it's a friend, a father figure or your own dad, he'll be sure to have a smile on his face when he sees this super fun and sentimental greeting. We learn lessons of humanity from our parents. Morals. Kindness. Sharing. How to win and how to lose. But we also learn how to lead. How to take care of others, how to be a good example (and what a good example is). Fathers show us the power of strength and how to time its use. They lay the foundation for our future castles, and then point us towards the path to reach the highest turret. Shape the future together this year by wishing your dad a Happy Father's Day. Start the day out right and build it up to the best day possible. Fathers are awesome people, hands down. But no one is as awesome as your father. He's a unique guy, who has imprinted on you his own version of love and life. And you've turned that around, made it the core of yourself and your path through the universe. Because awesome fathers produce awesome women, and you're on the track to greatness. This Father's Day, look back at your roots and shower them in love. 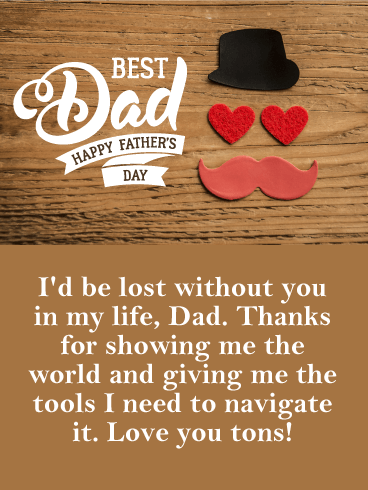 Wish your dad an amazing day and say "Thank you." Your father's "bear hugs" have always pleased you, even as you tried to dodge his arms and wiggle out of his grasp. This year, on Father's Day, send him a hug of your own with this energetic puppy. Hugs are, after all, warm, solid declarations of love. Your dad has loved and protected you for years. And while you will never be able to repay him for all of them, you can tell him how deeply you love him. 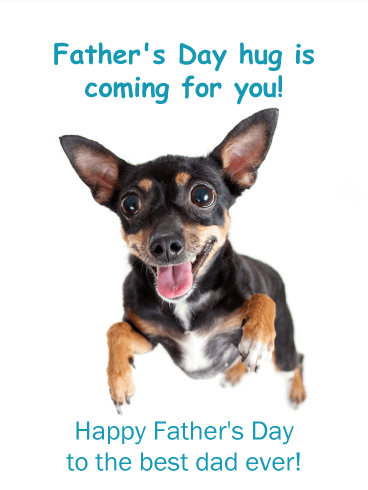 Near or far, in person or through this hyper pup, give your dad the best hug ever on Father’s Day. Father's Day is a time to acknowledge one of the most important people in our lives. Fathers guide us, teach us, love us. They are one of our pillars in the world, someone we can always turn to for advice and support. From bad days to catch-up phone calls, they always provide a listening ear and are full of bad jokes that have us laugh even as we roll our eyes. 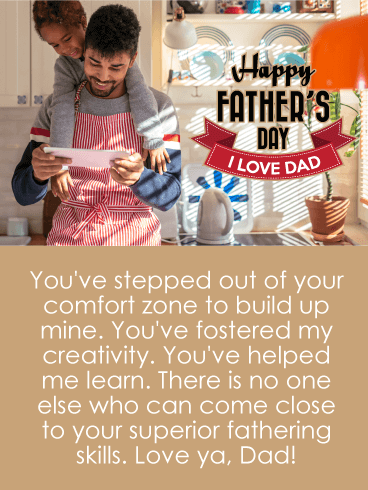 Fathers do so much for us, and so on Father's Day return the favor. Send him wishes of love, send him oodles of support, and let him know just how deeply you appreciate all that he has done. Fathers and daughters go together like cupcakes and frosting. You can have one without the other, but the combination is so much sweeter. Wish your dad a happy Fathers Day this year and let him know how awesome a team you guys make. From cooking in the kitchen to tramping in the woods, everything is better when the two of you join forces. Get the duo back together by bridging the gap with the heartfelt Father's Day card and wish him a fabulous day! 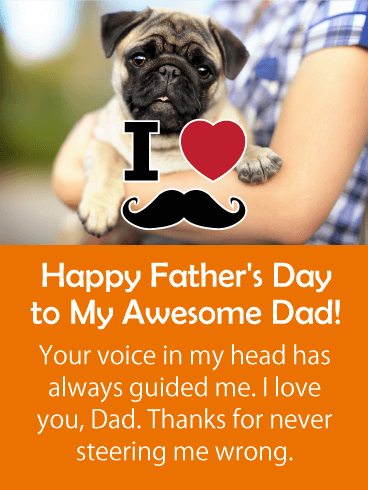 Wish your father a day of happiness with this energetic card! Over the years, your father has celebrated you and your accomplishments, so this Father's Day celebrate him. His role as father has set you on the best path possible, and your happiness begets his own. 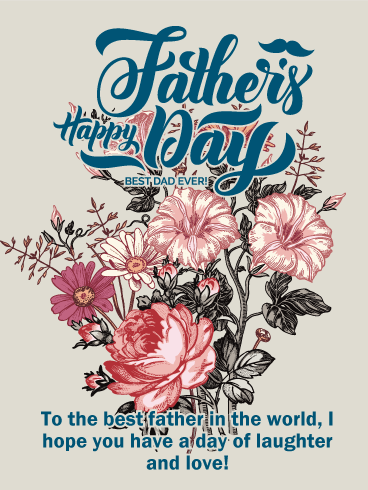 Fill his day with joy and let him know what a wonderful father he's been to you over the years. Family activities like camping and backyard barbeques are the memories that form the core of our childhood. And at the center of many of them are fathers and the skills and experiences they shared with us. This Father's Day, it's your turn to share with your father. Share your heartfelt memories. Share your love. Share the credit for the person you are with one of the people who shaped your sense of self. 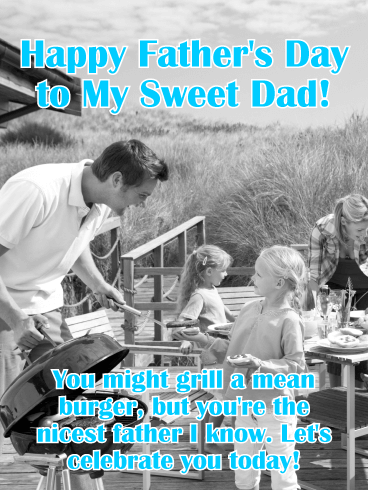 Wish your father a grilled burger and sunny days, and thank him for teaching you how to win at life. 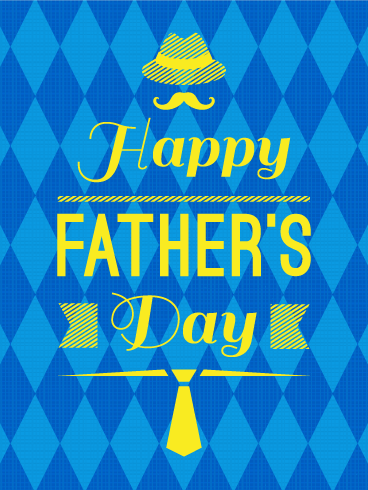 Wish your dad a day of joy on Father's Day this year! Your father has always been the one person who can cheer you up. From scraped knees to middle school bullies, he keeps you smiling and helps dry up your tears. Let him know how much you love and appreciate him with this bright card! After all, Father's Day is the perfect time to lift your father's spirits as high as they can go. We will always be the little princesses in our father's eyes. And to us, they're the knights in shinning armor who have protected us and taught us how to wield our own weapons. 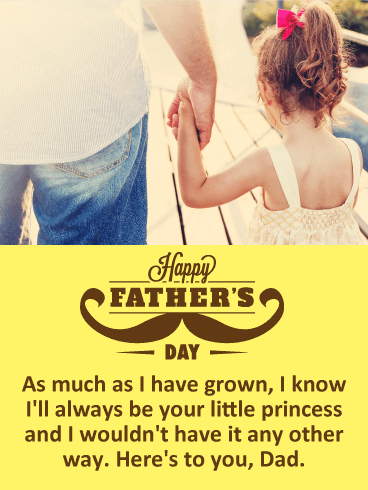 This Father's Day, show him the relationship between you is still the same. Father and daughter. Princess and Knight. Bonded through pure love and connected by laughter. 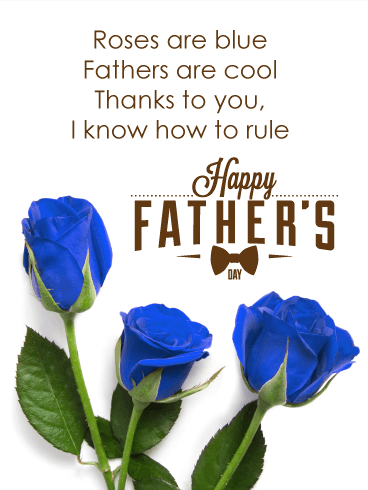 Wish your father a spectacular day and let him know how much he means to you, now and for always. Arts and crafts might be left behind in the memories of summer camp, but your dad will never not love receiving your gifts and attention. Shower your father with praise this Father's Day with this crafty card, full of love and silliness. Let him know that he crosses your thoughts daily and you would be a poorer person without his love. Wish your dad the best Father's Day ever with this card and watch him glow with joy.